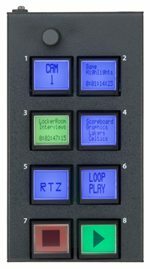 The KeyShot is designed to be installed directly behind a computer keyboard and can be operated as a video cue controller for video disk recorders/servers using the Sony and Odetics protocols. In this Machine mode, KeyShot is a powerful workstation or video server controller giving instant access to video cues in live or post-production applications. Alternatively KeyShot, in Host mode, can be managed by a workstation or system suitably programmed to interface to it. The KeyShot is equipped with ten LCD graphic keys which can display graphics or up to eighteen characters of text, a further twelve function keys and a rotary encoder. Interfacing to the controlled or Master system is via plug-in modules, providing RS232, RS422, USB or Ethernet control ports.